You’re invited to a very special open house in Yellow Springs on Saturday, May 6 from 5-6:30 pm. The open house at the home of OTSE board member Jon Paul Rion is a fundraiser for OTSE. 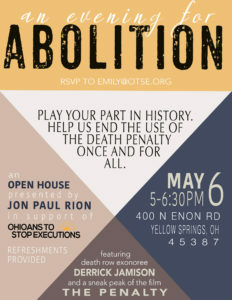 It will be a great opportunity to hear about OTSE’s recent successes and action plan to end the death penalty in Ohio. You’ll also be able to catch an exclusive preview of an upcoming documentary, The Penalty. Please RSVP for the open house to emily@otse.org. 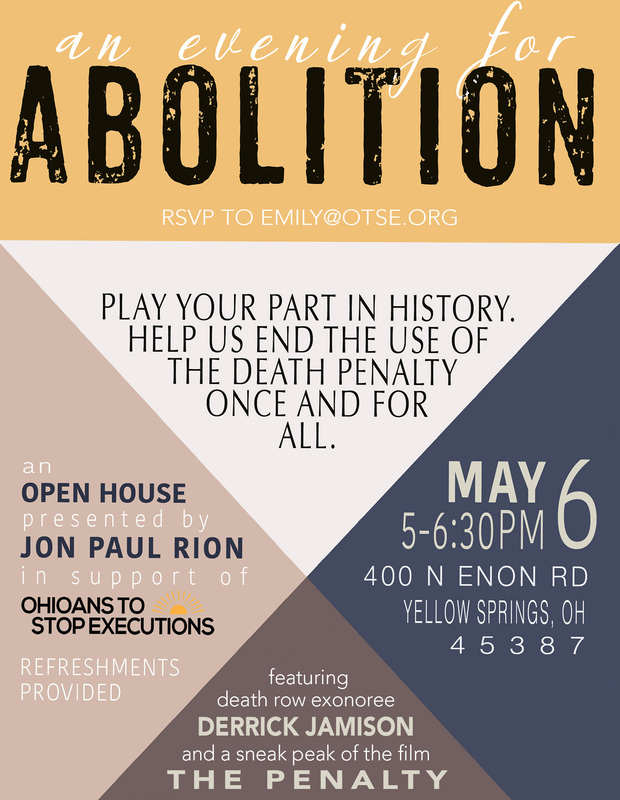 If you can’t join us in Yellow Springs on May 6, you can still contribute to our work to end executions by clicking here! We hope to see you in Yellow Springs. Together, we will end executions in Ohio—and we need your help. We’re ready to make history. Are you? OTSE is a 501(c)(3) non-profit organization founded in 1988 by individuals and organizations across our state. Our partners include the Ohio Catholic Conference, the Ohio Council of Churches, the ACLU of Ohio, Amnesty International, the NAACP of Ohio, the Ohio Association of Criminal Defense Lawyers, Murder Victims' Families for Reconciliation, Witness to Innocence, Murder Victims' Families for Human Rights, Families that Matter, and the National Coalition to Abolish the Death Penalty, among others.